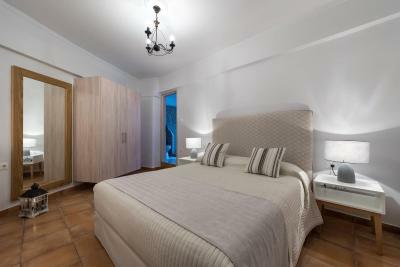 Lock in a great price for Villa Maria Damigou - Firostefani Caldera View – rated 8.8 by recent guests! The view from our balcony was amazing! We loved having breakfast and enjoying the view each morning. The staff was super friendly and accommodating. We had a very late night flight on the day of checkout, and they held our luggage all day for us. 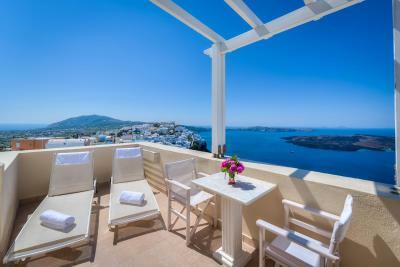 The hotel is only about a fifteen minute walk to the main bus stop in Fira. The location is perfect. Great location. Excellent breakfast with a great view. I absolutely loved this place. Perfect view every night for sunsets.didn't have to go to busy streets at night for that. Absolutely relaxing week...plus great big breakfast in the suite . Lovely, quiet area, conveniently located near transportation. Wonderful breakfast included. Friendly, helpful staff. Breakfast ( egg, sandwich, pastries, yogurt, fresh juice) brought to us with great view. 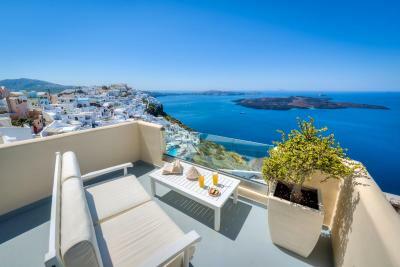 Walking distance of Fira. 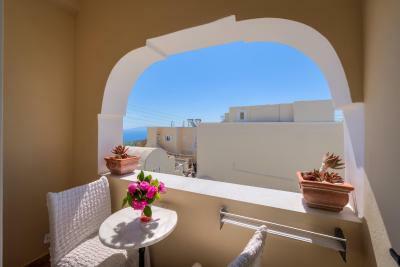 Situated at one of the highest points in Firostefani, the hotel offers some of the best views from their rooms. Our room was on the top floor and the view from the large balcony was spectacular! 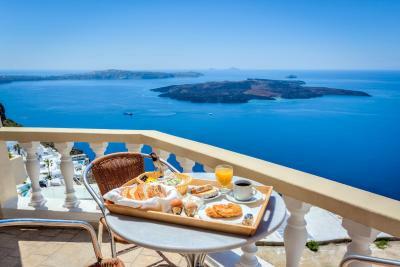 The daily breakfast delivered to our balcony was great. Room was very clean and spacious. They also offered us beach towels for a cruise we took. Great views. Delicious breakfast including yummy omelette. The staff was very attentive. Our boat did not depart until the late afternoon, but we were able to store our luggage and pass the time on the balcony overlooking the caldera. We greatly appreciated this. The best location ever...just up the path from the main crowds, and the view from our balcony was amazing! Anna and Jerry were super hosts. Easy arrangements for airport transfer was excellent. 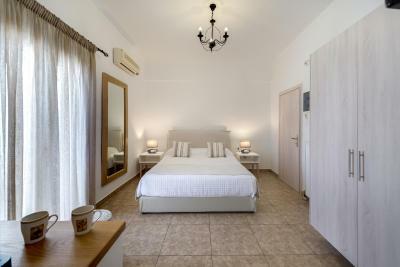 Great place to stay in Santorini, great value. Great location and great value. 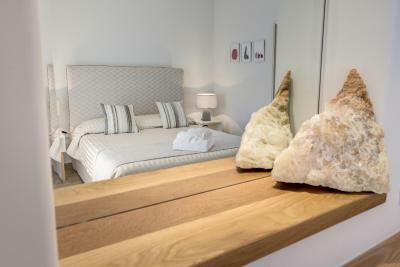 Located in Firostefani, a 10-minute walk from Fira, Villa Maria Damigou features rooms and suites with free Wi-Fi. 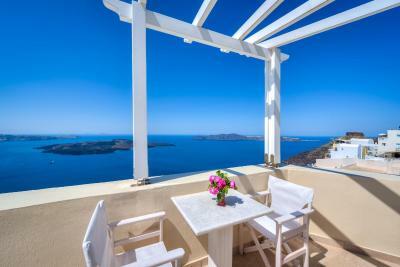 Breakfast is served in the furnished balcony overlooking Santorini’s volcano and the Aegean Sea. 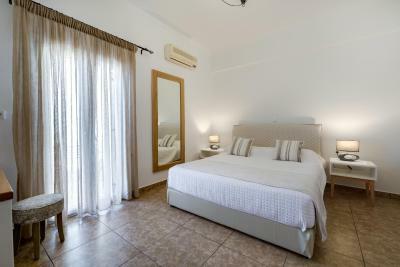 Each room includes air conditioning and a satellite TV. 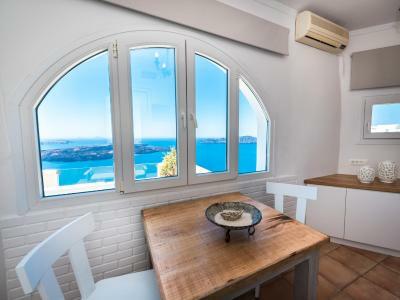 They also have a fridge, a coffee maker and a dining area. Firostefani is a quiet area with some restaurants and shops. Lively Fira offers many entertainment options such as bars and clubs. The beach of Monolithos is 3.1 mi away. 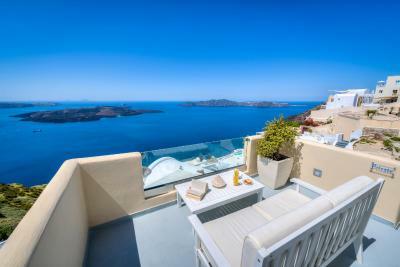 When would you like to stay at Villa Maria Damigou - Firostefani Caldera View? 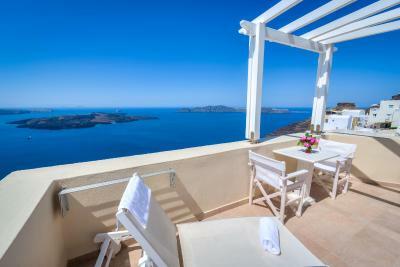 Features a balcony with views to the Aegean Sea and the Volcano. 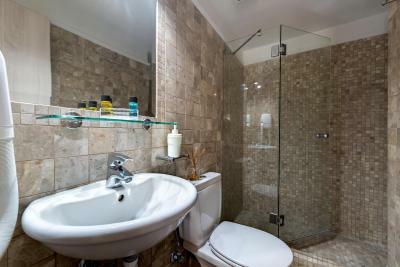 It features a kitchenette with fridge and a private bathroom with hairdryer. Please note that this room type cannot accommodate a child. 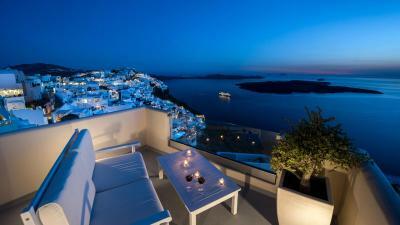 Features a private balcony with partial views of the Aegean Sea. 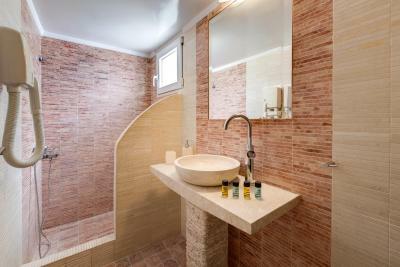 It features a fridge and a private bathroom with hairdryer. 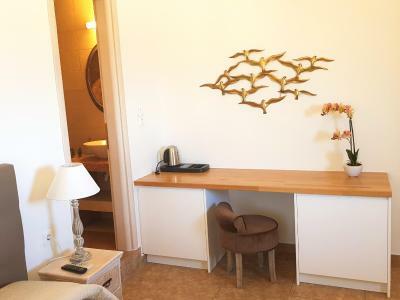 This room features a fridge and a private bathroom with hairdryer. This room type doesn't have views. 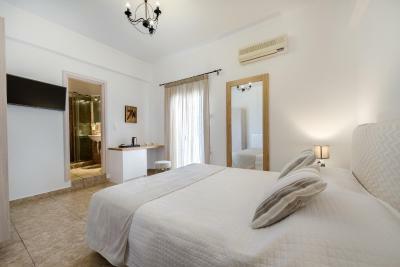 Featuring Caldera views, this suite includes a balcony, spa bath and sofa. 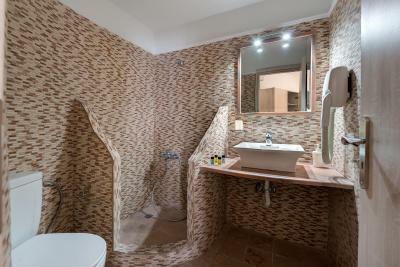 House Rules Villa Maria Damigou - Firostefani Caldera View takes special requests – add in the next step! 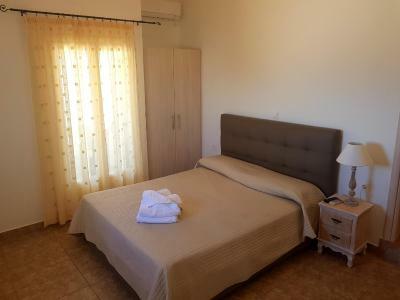 Villa Maria Damigou - Firostefani Caldera View accepts these cards and reserves the right to temporarily hold an amount prior to arrival. Please inform Villa Maria Damigou - Firostefani Caldera View of your expected arrival time in advance. You can use the Special Requests box when booking, or contact the property directly using the contact details in your confirmation. Friendly and helpful staff. Short walk from Firostefani bus stop. Magnificent view from room. Excellent breakfast. Loved it. The breakfast was the same everyday and wasn’t good. The price too expensive for the rooms. 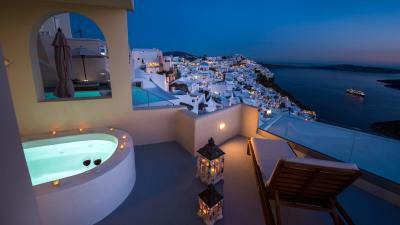 Location was amazing and very accessible and the view was amazing from balcony. The staff was very nice. Balcony is only available for guests during breakfast. Breakfast and view from breakfast area. Very hard to find if you are driving. 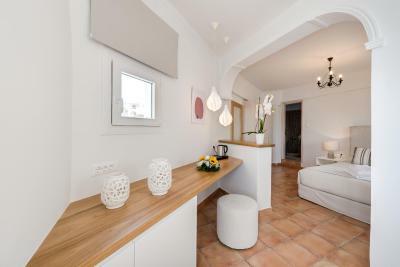 Great Location - Clean and nice - good value! Location excellent - not as busy as Oia and Fira, lovely walk from Firostefani to Oia (~2.5 hours) and Fira. Staff very friendly and lovely breakfast! Owner was very helpful and friendly. The lack of a pool. The view is spectacular if you select a room with a sea view. 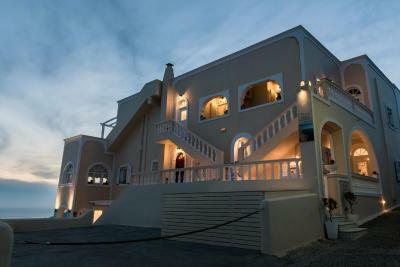 The location in Firastefani is great. Plenty of restaurants nearby but just far away enough from the maddening crowds in Fira. 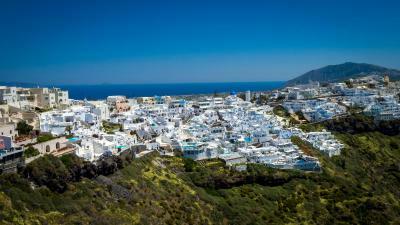 It's about a 15-20 min walk to Fira which is the main shopping and restaurant hub that services the cruise ships. Fira can get very busy when the cruise ships are in town. There's also a mini-mart a few minutes walking distance where you can buy beer, wine, and snacks. You can also request breakfast be brought to your room which is a nice touch. Coffee at breakfast seemed to be instant coffee served in a French press. 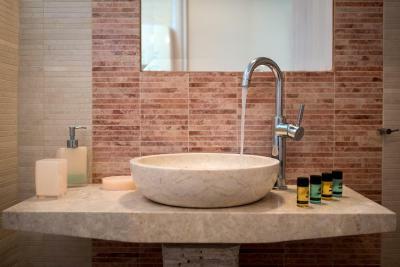 No bottled drinking water in the room. No pool or jacuzzi. 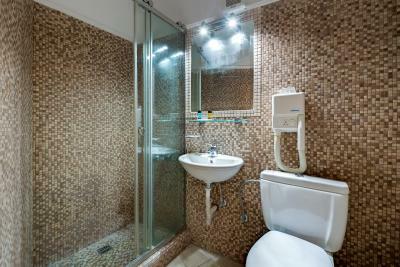 Excellent central location with groceries shop nearby and many excellent restaurants. 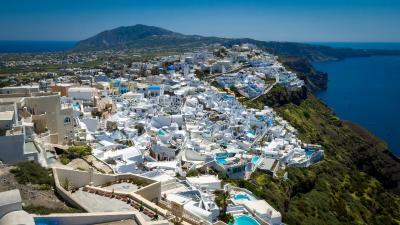 Not too many tourists like in Oia or Thira. 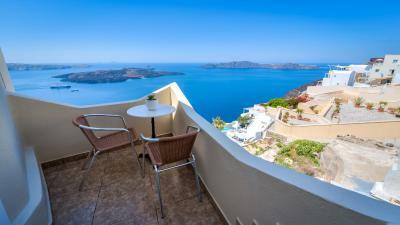 Spectacular view of Caldera bay, and lovely balcony to enjoy the sun and view with sundowners. Must be careful to book a room with 'sea view' otherwise you'll get a back room with no view. Breakfast was delivered to your room and pretty good, loved the spinach pie. Amazing location. The view from the room and the balcony were just breathtaking. Rooms were spacious and comfortable. We loved it!